Australian Shepherd's exact origins are unknown. This is a breed very much loved by people all around the world and was exclusively bred in the United States of America. This is a very versatile dog breed and is used around the world as farm dogs for ranches and farms where they assist in herding, this breed is also used as a watchdog as well as a retriever. 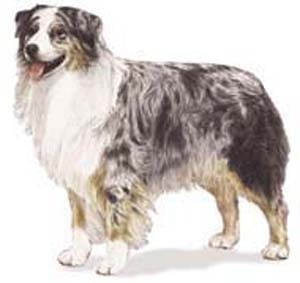 This breed is generally referred to and is well known as the "Aussie". This Dog breed was actually developed as a herding dog on farms and ranches in the western United States. Although the breed is commonly known as the Aussie it did not originate in Australia. The breed got its name because they were bred and used by Basque shepherds who had migrated to the United States from Australia. The Australian Shepherd has some inherent hereditary health problems, these include back problems and diseases, hip problems, and vision problems. Epilepsy is also one of the dog diseases that can affect Australian Shepherds. It is also an established fact that if there is a merle on merle breeding, the offsprings have a 1 in 4 chance of being blind and or deaf.